Data from the Council's report. The data, covering from January 2017 into 2019, detailed nearly 40,000 evictions that took place across the five boroughs. The data broke evictions down by borough, council district, state legislative and congressional districts, and zip codes. It overlaid eviction information with data on code violations filed with the Department of Buildings and Housing Preservation and Development. The map also indicated buildings that have been on the city’s speculation watch list, which identifies recently sold rent-regulated buildings where potentially predatory investment may put tenants at risk. In 2018, out of over 230,000 eviction petitions filed, only 9 percent (20,804 evictions) were executed by the City Marshall. Johnson said this was due in part to the Universal Access Law — which passed in 2017 by the City Council and is slated to be fully implemented by 2022. The law requires the city’s Office of Civil Justice Coordinator to establish programs for access to legal services for tenants facing evictions. In its’ first year of implementation, the law provided free legal services to more than 87,000 New Yorker, according to the data. Laurel said the funding for law, also called the “right to counsel” law, has given tenants who are being legally evicted from them homes to fight the eviction in housing court. The Universal Access Law matches tenants in housing court with pro-bono attorneys from non-profit legal service organizations. The tenant is interviewed to make sure they are eligible for the program. She added tenants should go to evictionfreenyc.org to find out if they qualify for legal services in their neighborhood. 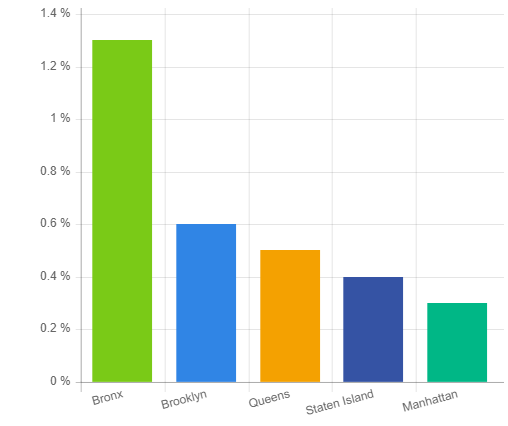 Bronx neighborhoods Fordham, Norwood and Melrose had the most evictions. Last year, 6,858 tenants were evicted in the Bronx; 2,709 were evicted in Manhattan; 5,701 were evicted in Brooklyn and 4,043 were evicted in Queens. The data said there was one eviction for every 79 units in the Bronx when compared with one eviction for every 345 units in Manhattan. In Brooklyn, Community District 5 (covering parts of East New York, New Lots, Remsen Village, Spring Creek and Starrett City neighborhoods) saw 1,479 evictions over the last two years. In Queens, Far Rockaway saw an estimated 1,144 evictions since 2017. In Manhattan, Central Harlem, Morningside Heights, Upper West Side and East Harlem neighborhoods saw 1,333 evictions since 2017. The borough of Staten Island saw 803 evictions in neighborhoods along the North Shore from Arlington to Tomkinsville. Johnson said the eviction locations, with the overlays of the state Senate and Assembly districts, will aid tenants and organizers advocating for rent reform this legislative session in Albany. But landlords and landlord advocacy groups such as Rent Stabilization Association (RSA) say the numbers show evictions have leveled off. They add that the city’s policies for tenants do not address legitimate landlord needs. and argue the data does not answer all the questions. Posilkin says more detailed data was missing, such as the type of evictions in play. A bigger issue, he said, is that city policy is focusing on court cases rather than creating rent subsidy or public assistance programs to help tenants so they do not have to go to court in the first place. He added that existing programs such as the city’s “one-shot deal,” an emergency rent assistance program which helps people who cannot meet an expense due to an unexpected situation or event, is a temporary fix for tenants who are not able . Tenant advocates, while hailing the universal-access law as vitally important, recognize that there is a bigger picture. “Right to Counsel is super important. On a much deeper level, the disconnect between wages and rents has been growing for decades and until that shifts this won’t get any better. Those on fixed incomes are the most vulnerable, who won’t be helped by the minimum wage increase, so Senior Citizen Rent Increase and the Disabled Rent Increase exemption programs are also very important,” says Gregory Jost, director of organizing for Banana Kelly Community Improvement Association. But the larger dynamics don’t change the fact that evictions can have a devastating effect on families and communities.